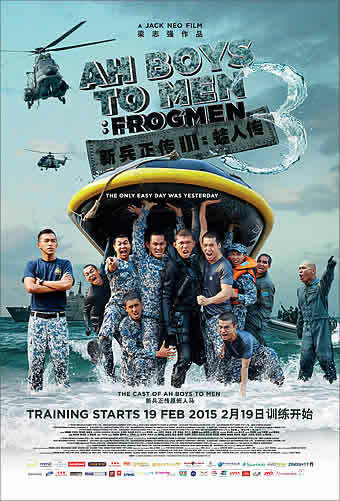 It's been awhile since I last wrote a movie review but I really had to share about this movie to all of you because I would really recommend you to watch it which is Ah Boys to Men 3: Frogmen. I had the privilege to be one of the first few to watch this movie thanks to Isabel for the Media Screening Passes. Here's what I think about the movie. This movie is yet another successful production by Jack Neo and is a a 2015 Singaporean comedy film. The film revolves all happenings in the predecessors and explores what might have happened should the boys have been assigned to the Naval Diving Unit. In the previous installments of the movie, the main story revolves around the main characters who were assigned to Tekong Camp for their National Service. This time it is kinda like an alternate universe where instead of going to Tekong Camp, they were assigned to the Naval Diving Unit trained to be divers or also known as the Frogmen. This camp only chooses 0.1% of Singapore population and is considered to be one of the elite forces. Of course since it is an elite camp the training they undergo are much more intense than the previous installments. In this movie you will see familiar faces from the earlier installments like Maxi Lim who plays Aloysius Jin a.k.a Wayang King, Joshua Tan who yet again plays the role of the spoilt rich kid Ken Chow, Wang Wei Liang who plays Lobang and Tosh Zhang who plays the instructor Alex Ong. A new character is Hei Long, a thud from Hong Kong played by newcomer Wesley Wong. His potrays a kid who immigrated to Singapore from Hong Kong following his parents and he hated them for the moving and losing his friends plus he had to go through NS because he was in Singapore. He also created a lot of trouble in the NDU (Naval Diving Unit) by starting fights and bullying Aloysius. There were many memorable scenes in the movie especially seeing them go through all the training which were really intense with heaving 'hammering' and physical training. They also had to carry much more equipment in this installment with their diving/wet suits and also training with their boats. For this movie, the Navy actually required all the actors to train for three months prior to filming to make sure they are all fit and ready to go through with the training. This was to portray a good image of the elite team as well. So you'll be able to see a lot of good body in this show especially since most parts of the show feature the actors shirtless. Other memorable moments include Ken's change of leaf, Lobang's family issues and also Hei Long's change in character. One of the most memorable moments in the film for me will be Aloysius standing up to Hei Long and showing that sometimes we let people bully us not because we are weak but because it is not worth it and we pity the bully. Not only that one lesson to learn from this film is choosing to do the right thing or to do things right, to be wrongfully right or rightfully wrong. I would say this is my favourite installment out of all three Ah Boys to Men movies and I would really recommend you to catch it in Malaysian cinemas on the 19th of March! Full of comical and memorable moments as well as many good lessons to be learnt from this movie, I applaud Jack Neo and the actors for a great movie.